Recently I hosted a baby shower for my friend Suchi. Since I enjoy planning parties, I had fun thinking through the menu, the crafts, and the games. The group of 12 attendees were mostly women that I didn't know, so it was fun to also meet new people. I figured I post the various elements over a few different posts. 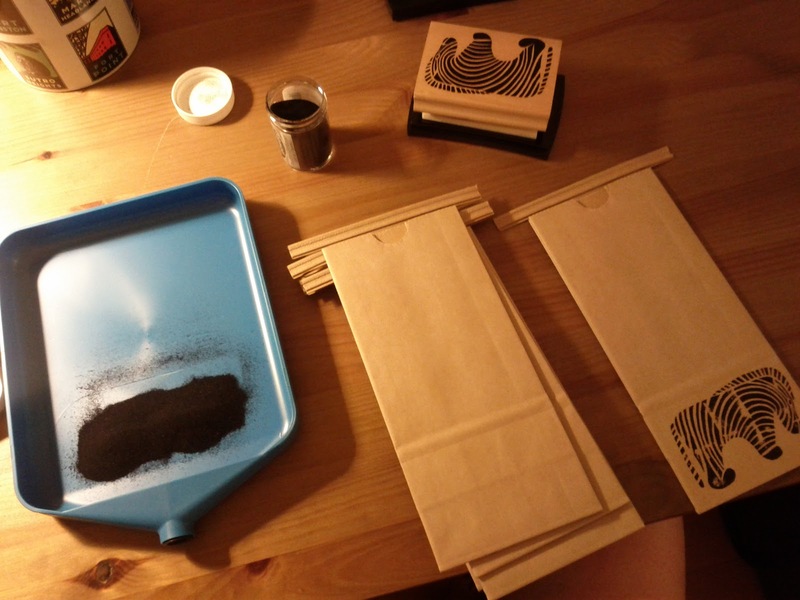 As I mentioned a while back, I recently took an invitation making class with Alison where I learned about embossing paper. Since that class, I have bought a lot of various supplies which I wanted to put to use for this shower. I ended up embossing the gift bags and a photo matting (which I'll cover in the games post). Since her baby shower was animal themed - I got a zebra stamp on ebay that I thought looked very tribal and not cheesy. 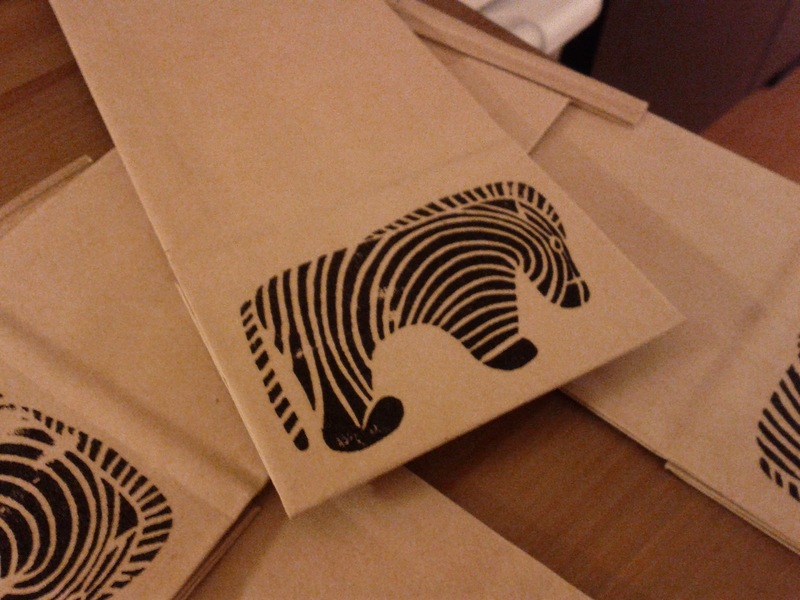 I then embossed black zebras onto the food grade kraft paper coffee bags that I got to use as favors for our wedding and never used. They are the perfect size for a little gift. I then filled red and white checked paper sandwich bags (super super cheap at Sur La Table) with homemade oatmeal chocolate chip cookies. My hubby made them the night before while I was doing something else. These cookies have become his specialty (we got the recipe from Philip) and we always have pre-made dough rolled into little balls in our freezer. He made 6 dozen of these bite size cookies. Next I tucked the red and white paper into the bag. I like edible favors the best. I then put the favors in a big woven basket we got a few years ago as a Christmas gift and put it by the front door so people wouldn't forget them on their way out. I had also ordered stickers to match her invitations (with wild animals) that had her name and date of the shower. I put them on the back of the bag. I was really happy with how the favors turned out. I thought that they were simple and playful, without being too cheesy.